Rugby games have always held a special place in my heart. The exhilarating feeling of scoring a try with your favorite team just never goes away. Unfortunately game developers across the ages have struggled to capture the essence of the sport into a video game, and I don’t blame them. The sport has a lot of complex rules , is fast paced , and features 30 players and 3 officials all running around doing their own thing. We have seen some gallant efforts in the past but one has to agree that the Rugby Challenge Series rain supreme in this department. Originally developed by Sidhe the Rugby Challenge series has a new developer at the helm , Wicked Witch (Published by Tru Blu Entertainment). The company set out to improve on the work Sidhe did with Rugby Challenge 1 & 2, and most of all implement ideas given by the rugby gaming community to further improve the series. This is where I have to applaud Wicked Witch for doing a stellar job – very few game developers listen to their fans and specifically implement the suggestions given by the community. Rugby Challenge 3 is in itself a brand new rugby game , sure it uses assets from the older titles in the series , but enough has been changed to brand it a totally new game. Let us not forget that EA Sports Rugby 05 , 06 and 08 all used the same game engine with only minimal tweaks to the various titles. So what sets Rugby Challenge 3 apart from its predecessors you ask? Well a lot actually , not only did they include the awesome “be a pro” mode but they have also reworked the kicking system, improved the AI , acquired more licenses from the various unions as well as for the first time ever in a rugby game added the fast paced 7’s mode. Playing Rugby Challenge 3 you will immediately realize that the game feels familiar, but plays like a different game. The AI is a lot smarter and they hit gaps in your defensive lines with accuracy and realism , rucks are difficult to win if you are defending, but the game let’s you string phases together when attacking. Knock-on advantages has also been correctly implemented and the ref will not immediately blow the whistle as in previous titles. Place Kicking now features a power bar and gone are the days of only kicking conversions from a short distance. The distance of conversions depends on your angle (like in real life) , for example if you have to take a conversion from the sideline the max distance will be around 50m. If you have to slot a kick from mid field then the max distance is around 60m. This was a gripe many gamers had with the previous titles. “Be a pro” mode is simply awesome. Popularized by other sports games like FIFA , ‘Be a pro” mode in RC3 follows the same standardized game formula. Create your professional rugby player , join a club and then progress your way up until you are selected for your national team and win the World Cup. One thing I love about this mode is the player progression system. Each match you are given certain goals that you must achieve in order for your player to increase his stats. This adds a nice touch to the game because it leaves you with that moral dilemma of do you try and run through the entire team and play selfishly to achieve your match goals or do you pass the ball so that your team might score and win the match. Another feature I liked about “Be a pro” mode is the fact that the team lineup changes in a realistic way , it feels as if the team is controlled by an actual coach and it adds a lot to immersion. Players also transfers to other clubs and injuries are realistic and frequent just like in the real sport. Wicked Witch has done a great job with this mode and definitely set the bar high for future rugby titles. Sevens mode is something rugby gamers have asked for , for years. Wicked Witch once again delivered and it plays just like the real life 7’s format of the sport. It is faced paced and defending requires a lot of concentration due to you only having 7 players on the field. Yes you can also play “be a pro” in sevens mode. 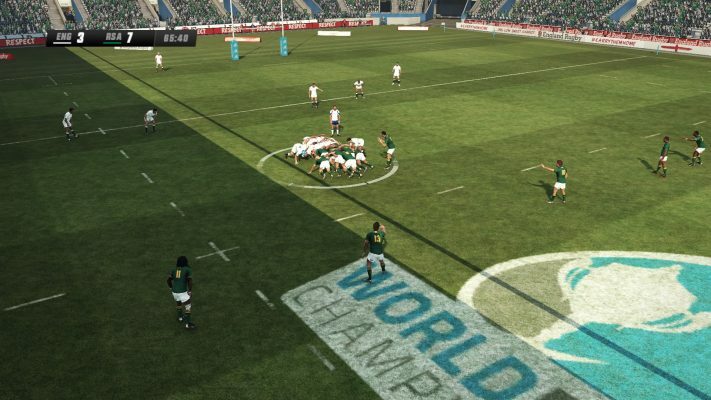 Rugby Challenge 3 also feature your standard Career mode , Online Play and a Fan hub where you can upload or download created players and teams. The game also has “game-play sliders” which you edit to make the game play the way you want it to. AI offloading too much? No problem just edit the slider. Each individual team can also be edited to mimic the style of play the real life teams play , for example – you can edit the Vodacom Bulls to play a more forwards orientated game-plan or The Crusaders to swing the ball wide every chance they get, it’s all up to you. I have encountered a few bugs in the game and sometimes the passing is still a bit wonky , but it is hard to judge the game on that without giving Wicked Witch a chance to release a patch first. All in all Rugby Challenge 3 is the best Rugby game on the market today without a shadow of a doubt. Would I recommend it to Rugby fans? Hell yes. It’s a shame the game is so out of date. It has squads from 2 years ago! They expect you to update them yourself through ‘fanhub’. Surely they could just bring out updates to give us the up to date squads. Also a little niggle, George Ford is on the cover of the game, yet in the game he is left footed (which can’t be changed) he’s actually right footed.